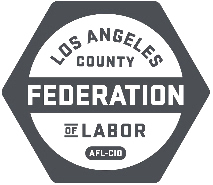 The Los Angeles County Federation of Labor, AFL-CIO, is the second largest labor council in the country representing more than 300 local unions and hundreds of thousands of rank-and-file union members. The Federation is a model for the nation of how a central labor body can transform the labor movement by actively assisting its affiliates with their organizing and bargaining drives, and changing the way unions do politics. The mission of the LA FED, as it is known, is to be a voice for working people battling to break into or remain in the middle class; to encourage them to actively participate in the civic and political life of their nation, state and community; and to advance public policies supporting workers and their families. To learn more about the LA Fed, please visit: www.theLAFED.org. We are seeking a motivated Secretary/Bookkeeper to join the team of one of the most innovative and successful local labor movements in America. The Secretary/Bookkeeper will be working with the administrative team under the Director of Operations. Salary: $24.00 per hour. This is a full time position. Benefits contingent upon qualification of hours include: Pension and 401(k) plan, Health, Dental and Vision. Position covered by OPEIU 537 collective bargaining agreement – Grade 2. Please email résumé with cover letter explaining why you’re interested in working for the labor movement, as well as three references to Karla Vasquez: karlat@thelafed.org. No phone calls. Applications accepted until position is filled. The Los Angeles County Federation of Labor, AFL-CIO is an Equal Opportunity/Affirmative Action employer.